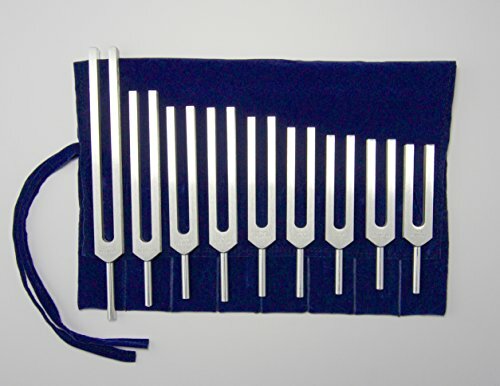 The Solfeggio/Holy HarmonyTM Tuning Forks contain the 9 tones that are frequently referred to as the "Original Solfeggio Scale". When sounded individually or with each other, these tuning forks create a powerful field of frequencies for health and balance. When sounded around the body, many people report profound healing and prayerful meditation experiences. These tuning forks are unlike any scales or sounds found on the earth. Each set comes in a beautiful protective velvet pouch for storage and travel. A detailed 20 page instruction manual is included with the 9 tuning forks. About Our Forks: Manufactured in the USA with the finest corrosion and rust resistant aerospace-grade, non-magnetic aluminum alloy. With proper care these forks will perform flawlessly for a lifetime. Contains all 9 of the energetically potent Solfeggio Frequencies. As featured on the acclaimed Holy Harmony CD! Powerful tools for subtle energy work, meditation, and spiritual activation! If you have any questions about this product by Jonathan Goldman's Healing Sounds, contact us by completing and submitting the form below. If you are looking for a specif part number, please include it with your message.